Sept. 23 will be a big day in Hendricks County. How big? Well, you could say it is 200 years in the making. An NHRA Top Fuel dragster will rocket the torch 300 mph down the legendary Lucas Oil Raceway dragstrip, the Bicentennial Experience, a mobile museum about the state&apos;s history will be here all morning, a Nashville recording artist will perform and we will have not one but two balloon releases that day, but that only scratches the surface. 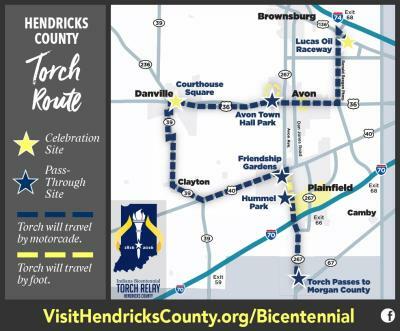 The Hendricks County Bicentennial Torch Relay presented by Duke Energy will celebrate 200 years from 9 a.m. to 1 p.m. on Sept. 23. A group of committed residents have worked for a year now planning it, and as you can tell from the event title, Duke Energy has provided a lot of money to make this celebration grand. Here&apos;s what you can expect that day with a few tips regarding what you need to know. I realize the event will occur on a Friday, but the hope is that you will take some time off work that day to be a part of history as everything will be free and open to the public. Before I describe the route and specific celebrations that the public can attend, I wanted to briefly explain the role of our torchbearers. The state allowed Hendricks County to name 24 torchbearers who have made significant contributions to this county and our state. These men and women could be past or current residents of the county and could be nominated posthumously. We received 130 nominations during the nomination period and 104 nominees. A local selection committee narrowed that list of 104 nominees to the 24 selected torchbearers based on their residency, service, achievement and recognition. That committee had a tough job and many great people who have made significant contributions to our county and state were not chosen. The torch will begin its day at Lucas Oil Raceway in Brownsburg. After a 30-minute ceremony, the Torch Relay caravan, including a hot rod that has raced at the Lucas Oil Raceway drag strip flanked by state police motorcycles, a media vehicle and a state operations truck, will make its way to Avon via County Road 1000 East to County Road 200 North to Ronald Reagan Parkway to U.S. 36. Once on U.S. 36, the caravan will head west to Avon Town Hall. After a brief stop at Avon Town Hall, another torchbearer will climb aboard the Mayberry deputy car. Yes, the same one that sits in front of the iconic Mayberry Cafe. The caravan including the deputy car will take U.S. 36 to Danville Town Hall where torchbearers will carry the torch on foot to and around the Hendricks County Courthouse Square. After an hour-long ceremony in Danville, a torchbearer will climb aboard a Duke Energy bucket truck, which will join the caravan as it heads south on Ind. 39. The caravan will pass through Clayton and Belleville to U.S. 40 where it will head east to Plainfield, pass the historic Van Buren Elm to Wabash Street to Buchanan Street to East Street and finally Stafford Road and then into Friendship Gardens Park. Torchbearers will carry the torch on foot on the Plainfield trail adjacent to Center Street from Friendship Gardens Park to Hummel Park. The final leg of its Hendricks County journey will be aboard an Indiana State Police Academy vehicle that will take the torch to Morgan County for our final handoff at 1 p.m.
Lucas Oil Raceway is one of the two places I would recommend watching the Torch Relay in Hendricks County. Gates will open at 8 a.m., and I would highly encourage you to arrive early even though the ceremony won&apos;t begin until 9 a.m.
One important public service announcement about this celebration: The public needs to enter the Lucas Oil Raceway property through Gate 3, which isn&apos;t the main front gate race fans are used to entering and where I&apos;m sure Google Maps or other GPS devices will take you. Gate 3 is located on the back side of the property near the intersection of County Roads 1000 East and 300 North. We also have free commemorative tickets for this celebration that can be picked up at any Hendricks County library, our Visit Hendricks County office or at the Lucas Oil Raceway administration building. You don&apos;t have to have a ticket to get in, but it will make it easier on our volunteers manning the gate as they need to make sure that folks coming for another event later that morning don&apos;t enter our gate. The Brownsburg ceremony will include dignitaries speaking on stage, Nashville recording artist and Brownsburg native Jeffery James performing the national anthem and of course the Morgan Lucas Racing Top Fuel dragster driven by none other than Morgan Lucas roaring down the drag strip with the torch. We will have ear protection that will be another keepsake that will be handed out free at the event. After the dragster completes its run, torchbearers will carry the torch back up the drag strip to the start line, and an emcee will share information about each torchbearer. 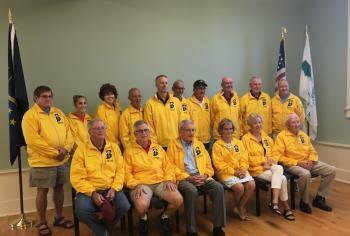 The torch will make a brief stop in Avon about 9:45 a.m., where torchbearers will take it around Town Hall Park Lake. This celebration will be brief -- 15 minutes or less -- and the area around the lake will be crowded as every fourth-grader in the Avon School District will be out there to cheer on the torch. They will have other celebratory activities including a balloon release, James Whitcomb Riley re-enactor and an emcee during the event, but if you want to attend the Avon celebration, arrive early. This is the other big celebration site that we encourage the public to attend. Even though the torch isn&apos;t expected to arrive until about 10:15 a.m., there will be plenty to do beginning at 9 a.m. 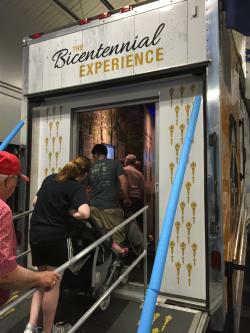 The Bicentennial Experience will open to the public at that time on the square as will the Hendricks County Historical Museum, located just a block south of the square at 170 S. Washington St. When the torch does arrive, a stage ceremony will include music, a county and state proclamation and a release of 200 balloons. It should be an experience you will remember for a long time. I pretty much covered the extent of the Plainfield celebration above, but there will be plenty of room along the trail system to cheer on the torch. It is expected to arrive at Friendship Gardens Park around 11:45 a.m. and will likely take about 30-45 minutes to get from there to Hummel Park. I know some torchbearers along that route plan to run with it, which could cut down on that time. So now you have all the details for the Hendricks County Bicentennial Torch Relay presented by Duke Energy. You can find more information about everything online here or by liking and sharing our Facebook page. Please plan to join us at one of these sites or even multiple ones if you wish as we make history on Sept. 23.